I have found that some of the best recipes come from family and friends. This falls into that category. My good blogging friend Cindy from Just North Of Wiarton & South of the Checkerboard left a comment saying that I needed to try her recipe for Ham, Mushroom and Cheese Quiche. Cindy reassured me that this was The Best quiche recipe ever. Boy was she right! Quiche is a great way to use up left-overs. This recipe was easy to make and very tasty. 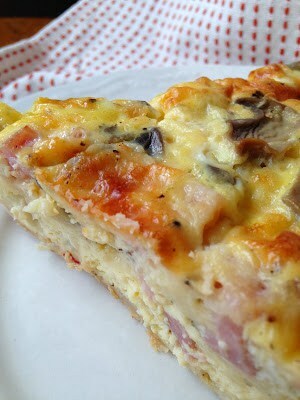 Ham, Mushroom and Cheese Quiche will make a delicious breakfast, lunch or dinner. It was also delicious reheated the next day! 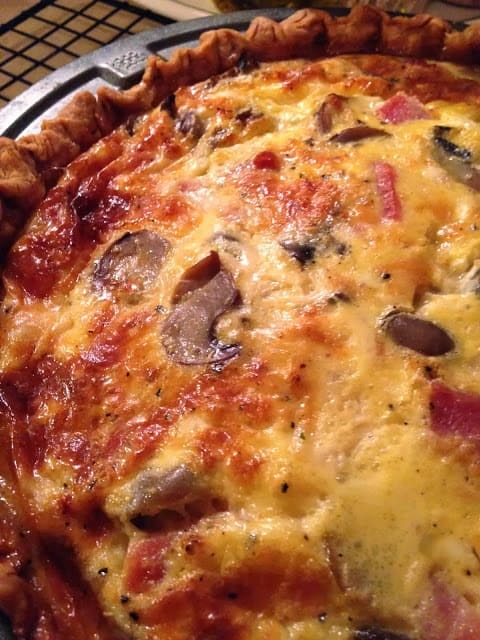 Thanks Cindy for this great quiche recipe, one I will be making over and over again. Quiche [KEESH]. This dish originated in northeastern  France in the region Alsace-Lorraine. It consists of a pastry shell filled with a savory custard made of eggs, cream, and seasonings. Various other ingredients such as onions, mushrooms, ham, shellfish and fresh herbs can be added. The most notable of these savory pies is Quiche Lorraine made with crisp bacon and Gruyere cheese. Quiche is classically made in a quiche pan, which had fluted, straight sides and ranges in diameter from 8 to 12 inches. Quiche can be served as a lunch or dinner entree, or as a first course or hors d’oeuvre. Brush pie shell with a little of the beaten eggs; prick bottom and sides of crust with fork. Bake in a preheated 450º oven for 5 minutes; remove and set aside. Reduce oven heat to 375º mix remaining ingredients and pour into pie shell. Bake for 30 to 45 minutes or until knife inserted in middle comes out clean. Here is another quiche recipe you’ll want to make: Bacon and Cheese Quiche. Ham, Mushroom Cheese Quiche was made using Wisconsin Marieke Gouda . Just made and put it in the oven! Can’t wait to see how it turns out! Thank you for this recipe! 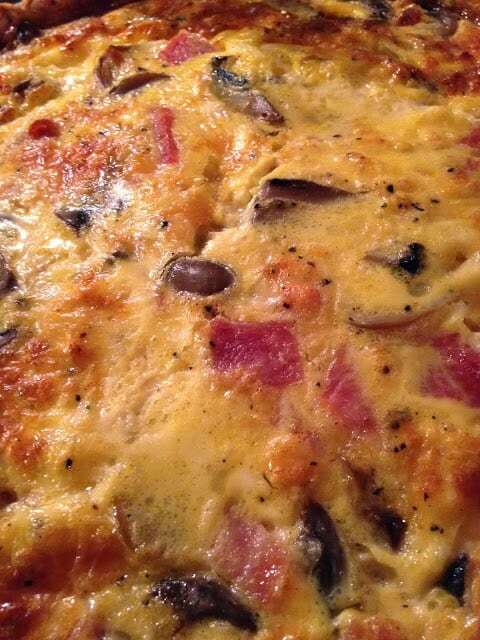 Hi Lynn, this quiche look so delightful, love it very much. I like the ham and mushroom combination. Thanks for sharing. 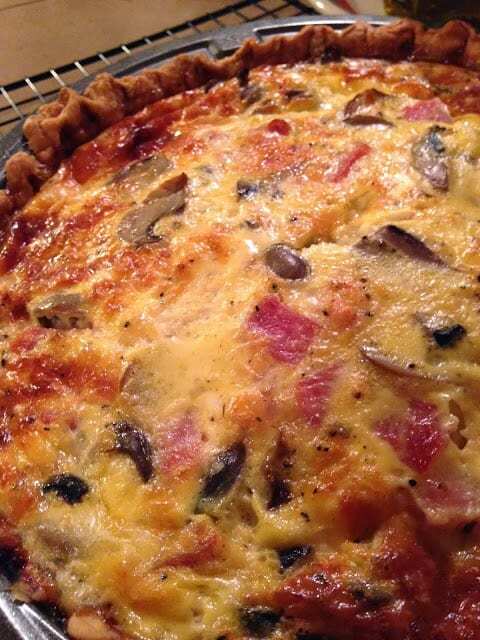 Good Morning Lynn, Quiche Lorraine is really popular with my family, so I was interested to see how you made yours. I love the addition of dry mustard, as that will leave a slight hint of heat in the mouth. How lovely that Cindy recommended this recipe and it turned out to be one which you loved. It certainly looks mouthwateringly good. You are certainly motoring ahead with your list of things to cook.